This chapter is the detailed configuration guide to Chukwa configuration. Please read this chapter carefully and ensure that all requirements have been satisfied. Failure to do so will cause you (and us) grief debugging strange errors and/or data loss. Chukwa uses the same configuration system as Hadoop. To configure a deploy, edit a file of environment variables in etc/chukwa/chukwa-env.sh -- this configuration is used mostly by the launcher shell scripts getting the cluster off the ground -- and then add configuration to an XML file to do things like override Chukwa defaults, tell Chukwa what Filesystem to use, or the location of the HBase configuration. When running in distributed mode, after you make an edit to an Chukwa configuration, make sure you copy the content of the conf directory to all nodes of the cluster. Chukwa will not do this for you. Use rsync. Make sure that JAVA_HOME is set correctly and points to a Java 1.6 JRE. It's generally best to set this in etc/chukwa/chukwa-env.sh. In etc/chukwa/chukwa-env.sh, set CHUKWA_LOG_DIR and CHUKWA_PID_DIR to the directories where Chukwa should store its console logs and pid files. The pid directory must not be shared between different Chukwa instances: it should be local, not NFS-mounted. Optionally, set CHUKWA_IDENT_STRING. This string is used to name Chukwa's own console log files. Agents are the Chukwa processes that actually produce data. This section describes how to configure and run them. More details are available in the Agent configuration guide. First, edit $CHUKWA_HOME/etc/chukwa/chukwa-env.sh In addition to the general directions given above, you should set HADOOP_CONF_DIR and HBASE_CONF_DIR. This should be the Hadoop deployment Chukwa will use to store collected data. You will get a version mismatch error if this is configured incorrectly. Edit the CHUKWA_HOME/etc/chukwa/initial_adaptors configuration file. This is where you tell Chukwa what log files to monitor. See the adaptor configuration guide for a list of available adaptors. The most important of these is the cluster/group name that identifies the monitored source nodes. This value is stored in each Chunk of collected data; you can therefore use it to distinguish data coming from different groups of machines. Another important option is chukwaAgent.checkpoint.dir. This is the directory Chukwa will use for its periodic checkpoints of running adaptors. It must not be a shared directory; use a local, not NFS-mount, directory. Setting the option chukwaAgent.control.remote will disallow remote connections to the agent control socket. The one mandatory configuration parameter is writer.hdfs.filesystem. This should be set to the HDFS root URL on which Chukwa will store data. Various optional configuration options are described in the pipeline configuration guide. To run an agent process on a single node, use bin/chukwa agent. Typically, agents run as daemons. The script bin/start-agents.sh will ssh to each machine listed in etc/chukwa/agents and start an agent, running in the background. The script bin/stop-agents.sh does the reverse. You can, of course, use any other daemon-management system you like. For instance, tools/init.d includes init scripts for running Chukwa agents. To check if an agent is working properly, you can telnet to the control port (9093 by default) and hit "enter". You will get a status message if the agent is running normally. One of the key goals for Chukwa is to collect logs from Hadoop clusters. This section describes how to configure Hadoop to send its logs to Chukwa. Note that these directions require Hadoop 0.20.205.0+. Earlier versions of Hadoop do not have the hooks that Chukwa requires in order to grab MapReduce job logs. The Hadoop configuration files are located in HADOOP_HOME/etc/hadoop. To setup Chukwa to collect logs from Hadoop, you need to change some of the Hadoop configuration files. 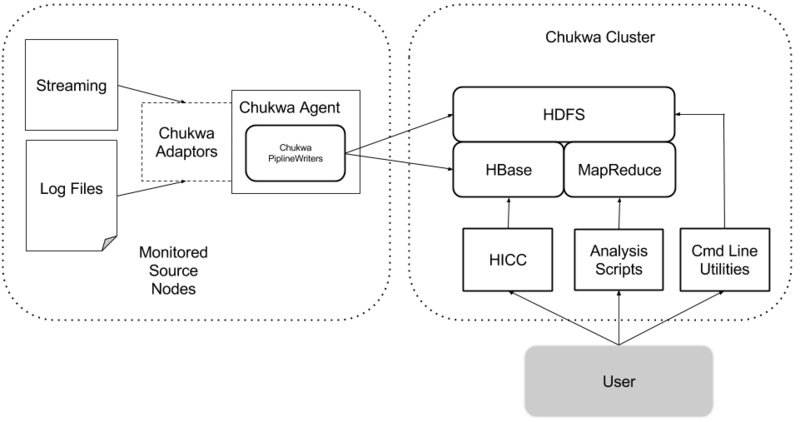 Chukwa is moving towards a model of using HBase to store metrics data to allow real-time charting. This section describes how to configure HBase and HICC to work together. Presently, we support HBase 0.96+. If you have older HBase jars anywhere, they will cause linkage errors. Check for and remove them. Edit etc/chukwa/auth.conf and add authorized user to the list. The processes are scheduled execution, therefore they are not always visible from the process list. If anything is wrong, use /etc/init.d/chukwa-agent stop to shutdown Chukwa. Look at agent.log file to determine the problems. This will set up the log file expiration for CHUKWA_HOME/var/log for log files older than 10 days. If the system is not functioning properly and you cannot find an answer in the Administration Guide, execute the kill command. The current state of the java process will be written to the log files. You can analyze these files to determine the cause of the problem.